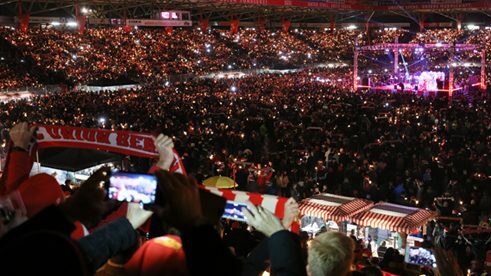 Since 2003 fans of the football club Union Berlin have been gathering for an Advent sing-along in their stadium on the day before Christmas Eve. But some Union fans no longer feel at home at the large-scale event. In Germany Christmas carols are part of the centuries-old tradition surrounding the holiday because they convey a sense of cosy homeliness. In contrast with former times, however, many Germans today satisfy themselves with listening to carols on a CD. Often Ring, Little Bell, Every Year Again and O Christmas Tree resound very untranquilly in department stores and crowded Christmas markets. And even at home, the carols usually ring out from a CD player. All the more astonishing, then, what has been happening for years on Christmas Eve in a forest area on the outskirts of Berlin: in the stadium “An der alten Försterei”, the home of the second division Berlin football club 1. 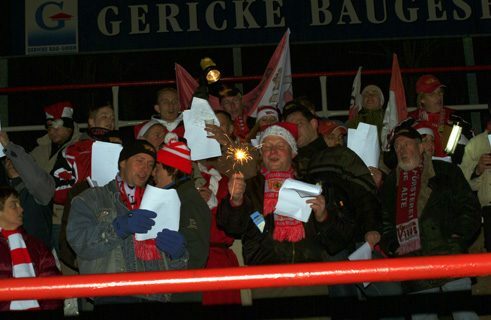 FC Union Berlin, fans have been gathering since 2003 for public Christmas singing. In the meantime, almost 30,000 people make up the largest Christmas choir in Germany – and very possibly beyond. In spite, or perhaps precisely because, of the unusual location betwixt firs and pines, the atmosphere is thoroughly cosy and homey. Certainly also because 1. FC Union Berlin, one of the best known professional clubs in the German capital, is distinguished by a special closeness to its fans, which has welded them together into the “Union Family”. A few years ago, thousands of fans pitched in to rebuild the stadium of the “Iron Men”, as the football club calls itself, buying penny shares to help refurbish their “living room”. The Christmas songfest is surely part of the effort to maintain the link to fans and fan culture in a commercial age of pro football. The sing-along was not launched as a marketing event by the club, but at the initiative of the fans themselves. 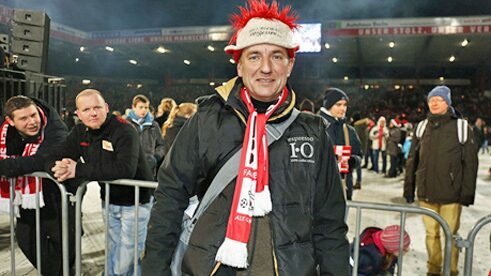 On Advent in 2003, when the club slipped to the bottom of league and the mood of the Union Family was at its nadir, the long-time fan Torsten Eisenbeiser had an idea: the family could warm its collective heart in these hard times with the traditional carols of the festival of brotherly love. “I thought that in this way we in the Union Family could ring in the Christmas season in a cosy atmosphere and then go home to our families”. Torsten Eisenbeiser, founder of the Christmas songfest | Photo (detail): © union-foto.de Because many loyal fans of the East Berlin club, founded in 1966, were not members of a religious community as a result of growing up in the GDR, and because many therefore knew few Christmas carols, Eisenbeiser copied some carols on sheets of paper. With these in their hands, eighty-nine members of his fan club Alt-Unioner (Old Union Supporters) stole secretly into the then still dilapidated stadium to sing themselves into a Christmas mood. Little by little, the voluntarily organised Christmas songfest developed into an annual ritual, at which thousands – now even tens of thousands – gathered to sing together with mulled wine, candlelight and songbook in hand. A local school choir strikes up the carols, a pastor reads the Christmas story. And in-between the festive songs the fans, clad in the red-and-white club colours, sometimes belt out a club anthem. The first christmas songfest in 2003 | Photo (detail): © union-foto.de The event has long since expanded beyond the boundaries of Berlin and the club. The sing-along is a fixed date even for “exile Unioners” now living in other cities. Even people from Scandinavia, Switzerland, Belgium, Spain, the Czech Republic and Argentina come to the Christmas gathering at the Old Gamekeeper’s Lodge. At the invitation of the fan club, even refugees from Syria and Iran have attended it. In 2013 the stadium was filled to the brim for the first time, so that the organisers decided to control the influx through the sale of tickets. Since then, the event has been sold out quickly; the proceeds go to the club’s younger generation. But some Union fans no longer feel at home at the large-scale event. “I used to think the Christmas singing was great, so like a family and so peaceful’, recalls Simon Kraushaar. “Two years ago, however, I was there for the last time, because suddenly there were fast-food stands on the lawn and everything seemed like a commercial show.” Eisenbeiser accepts this view, but says: “It wasn’t a deliberate decision to make it an event. The people did it themselves. We just have to live with it.” He still sees the songfest as a sing-along of the Union Family – now only with a lot more guests than before. Gunnar Leue is a freelance journalist and has himself been several times at the Christmas songfest. Copyright: Text: Goethe-Institut, Gunnar Leue. This work is licensed under a Creative Commons Attribution – Share Alike 3.0 Germany license.